Schooled premieres January 9th on ABC. Last year, ABC decided to pick up The Goldbergs’ spinoff, Schooled. 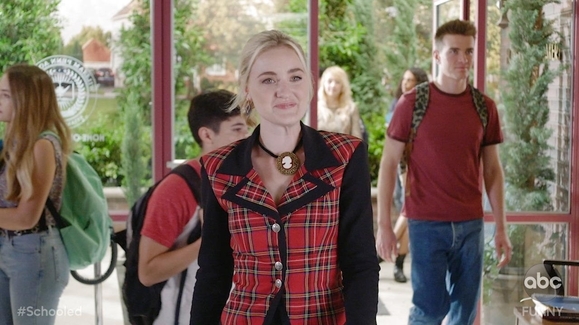 AJ Michalka returns as Lainey Lewis, and let’s just say life hasn’t gone as she would have hoped. Along with Michalka, other The Goldbergs alums include Tim Meadows as Mr. Glascott, Bryan Callen as Mr. Mellor amongst other familiar faces. It is now the 1990s and things are different, way different. Short shorts are out, Michael Jordan is in, and well, technology is gradually becoming a way of life. Schooled comes off very similar to The Goldbergs and is truly just the 90s version of it. Everything about it from the inspiring monologues to the decade appropriate atmosphere reminds us of the show before it. However, one can still enjoy watching this series because it does stand out on its own. The pilot episode re-introduces Lainey as she returns to William Penn Academy, but this time, as a teacher. And while it may be the 90s, not everyone has adapted with the times, namely Coach Mellor. The Schooled pilot tries to balance a new decade and what it brings while still maintaining the feel-good essence of its predecessor. Is it cheesy? Yes. Are there some silly, unnecessary moments? Certainly. But it’s still a fun watch, especially if you’re a fan of The Goldbergs. Sometimes the pilot can be too predictable, but it’s to be expected in a show like this. Michalka as the central character is a drastic change but a welcome one. She holds up on her own really well and has wonderful chemistry with all the other characters. The best part about the pilot is that it sets up the series really well, and gives us an expectation as to what it will be like. At its core it’s very much like The Goldbergs, however, there is going to be a lot about it that will unique and special to it. Having Meadows and Callen come back for Schooled was a genius idea and they bring a fun allure to the pilot. It’s also great to see how this new decade change is impacting them, and how they are dealing with it. Being a 90s kid myself, I really enjoyed what the pilot brought and it has to be said that the music was on point. There’s humor, inspiration, and a whole new decade of things to look forward to in Schooled, and I for one am super excited about what this series has in store for us. Be sure to check it out! I give Schooled‘s pilot a B.